Just about anyone can grow a hanging basket brimming with blooms with a bit of creativity and some basic tips about baskets and what to put in them. A good container for plants is one that has sides and a drainage opening of some sort. Most of us think of the green or white plastic baskets that have a reservoir for water in the bottom - a good choice no doubt. However, there are millions of options for fun and creative hanging baskets. Create a drainage hole with a drill and add some wire or chains and just about anything can become a "hanging basket." A light weight potting mix is mostly comprised of peat moss and perlite. Both of these products allow good drainage so that roots can spread to develop full and sturdy plants. Osmocote helps reduce the need for fertilizing throughout the summer months. Soil moist on the other hand, is an excellent additive because it keeps the container from drying out so quickly. 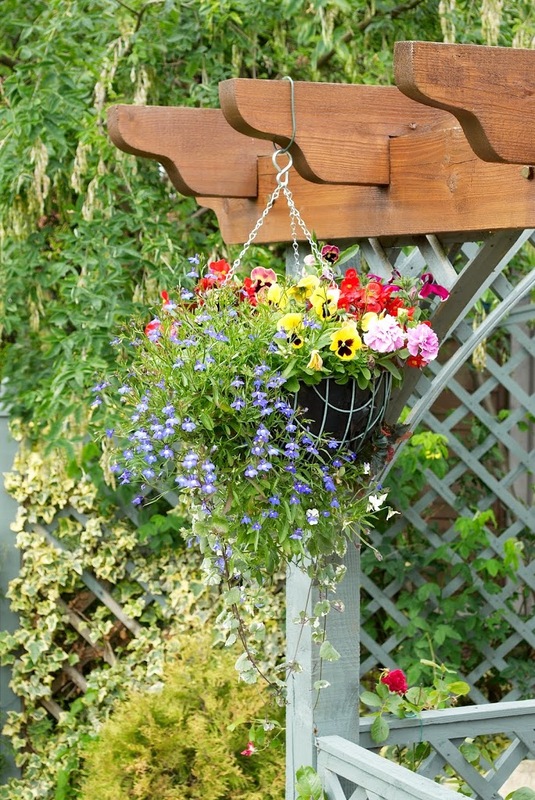 Lack of water is the number one cause of death or failure of beautiful hanging baskets. Simply follow the instructions on packages of Osmocote and Soil Moist for the best results. Now it's time to consider the ingredients of a well-balanced basket. We talk in terms of thrillers, fillers and spillers. A thriller is the tallest plant in the basket and draws your attention via height. Examples include spikes, sun coleus and argyanthemum. The filler is the medium-height plants in the basket that fill the majority of the pot horizontally with its bushy shape. Sun plants on my filler list include melampodium, verbena, geranium and petunias. The spillers complete the look, pouring over the sides of the container to add trailing drama. Spillers with plentiful blooms include bacopa, tapien verbana and trailing lantana. The combinations are endless and if you are needing inspiration, just stop by the Garden Center to see some examples or to ask our garden experts to help you design the picture perfect basket. If you don't have the time or just don't want the mess, pick one of the hundreds of beautiful baskets that we have grown for you.